The SSEC is a bit of a challenge for me to tackle, as I have no access to detailed intra-day data. Without a look at a 30-minute chart at least (preferably a 5 minute chart), I am unable to differentiate between the short-term structures, and am left with some blind guessing. The long-term structure appears reasonably clear. 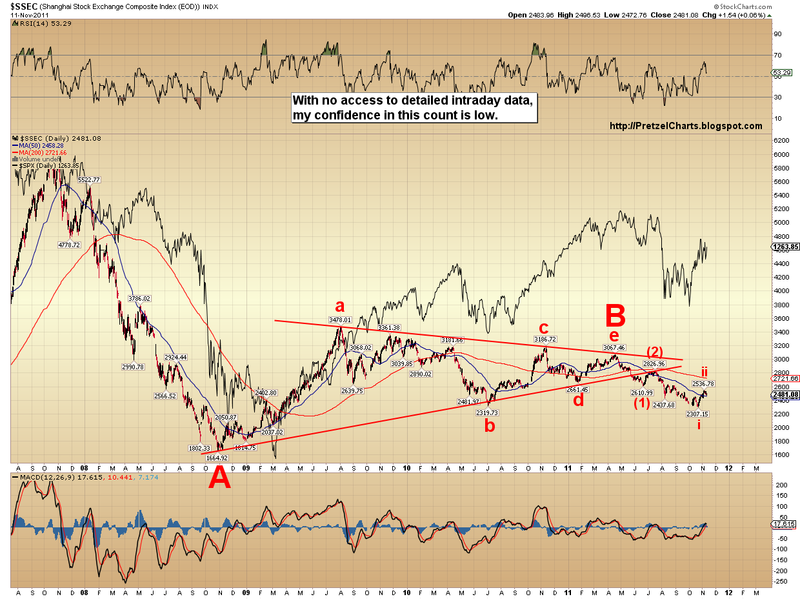 It would seem that 2008 was an A-wave crash, and 2009-2011 have been a B-wave triangle. The triangle counts reasonably well, and demonstrates the correct 3-3-3-3-3 structure. Without intraday data, where I run into difficulty is the short-term picture. Regarding the short-term picture, I cannot overstate the importance of having intra-day data. Okay, that's not completely true -- I could easily overstate the importance of this. For example, I could say, "A lack of intra-day data is the leading cause of slow and painful death in North America." That would be a definite overstatement. But, as far as the counts go anyway, it's pretty important data. 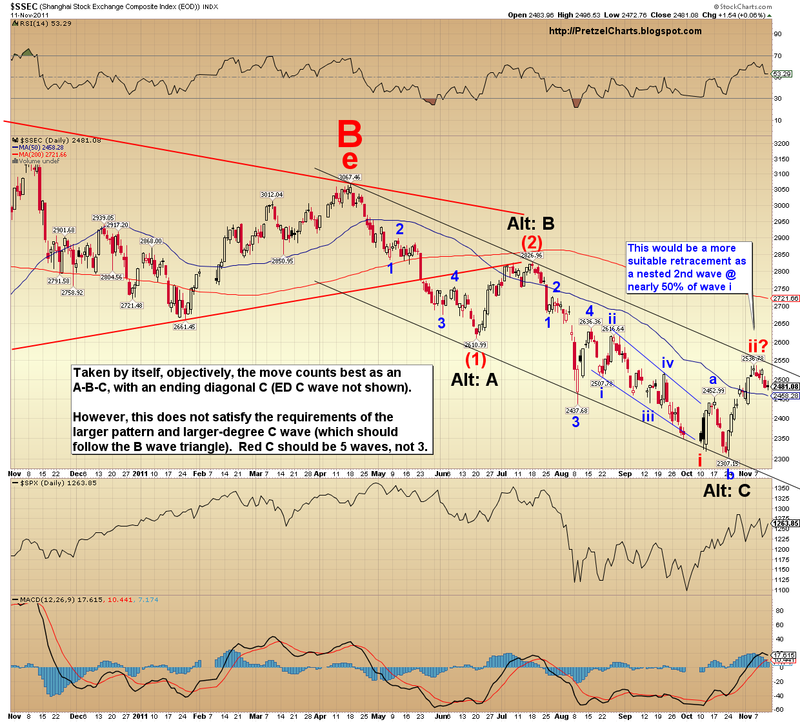 The second short-term chart is an ugly way to count the entire leg down as one wave. I don't like this count as much, because it doesn't really balance very well. In fact, when I look at the count this way, I am again inclined to think it counts better as an A-B-C. The problem is, if the larger count is correct -- and there's no reason to think it's not, it's a pretty good triangle -- then the current wave down should be part of red wave C. And C-waves are never A-B-C's; they are always 5 wave moves. But almost anything is possible, since I have no intra-day data. Anyway, here's the other ST chart. As we can see on this chart, I forgot to save the chart I was working on, so I have to go re-do the whole thing. I realized this after systematically uploading four charts to this article, which were all wrong (not shown). I have seen some people try to count the whole wave as a leading diagonal. This doesn't really work, since leading diagonals, unlike ending diagonals, usually break up into 5-3-5-3-5 moves. Allegedly, they can also break up into 5-3-5, although the reference materials offer no further detail than that (in this regard, the literature is a bit like a cookbook which says, "You need to bake this for 5 hours. Or 3 hours, whatever." with no additional instruction). I suppose you could count this as a 5-3-5 fairly well, with an ending diagonal inside the leading diagonal, and a partridge in a pear tree. So that's what I've got. Again, without ST data, it's a bit like throwing darts at an effigy of a politician while blind-folded... without the tell-tale "OW!" you'd get from the real thing, there's just no way to know for sure if you've hit it or not. So long or short here? I wouldn't take a position based on this personally. As I stated roughly a billion times in the article: I have no intra-day data, so all this is low confidence. This is at a reader's request -- it's the best I can do with the data I have. Besides, nothing on this site is trading advice. sorry i am new to EW, and i notice the word nested is used often. what is the meaning of nested wave? Nested refers to a subdiving wave... so the third wave *within* a third wave, for example. In the case above, it is waves i and ii of the wave (3). It's nested because (1) and (2) are presumed to have occured, so it's an expanding 1-2, i-ii count. In other words, the different subdivisions of a wave that's within a wave. When it hits the third wave, it will be wave iii "nested" within the larger wave (3). Hi! I share your view of counting the rally from 08 as a triangle but i am having a difficult time counting this downward move. So I searched the net for another possible count and stumbled upon this. This count tells us that the crash of 2008 is the whole wave 2 and that the lesser degree 1st and 2nd wave are already in place. It would be helpful if you can take a look at this count and give your comments about it. P, where is the intra-day data? Just kidding of course. Good of you to respond to a reader request. Nice work! Thanks for posting it. Sorry it was such a pain in the you know what to analyze without the intraday data. I do have a suggestion though for a pretty good proxy for $SSEC that you could use for intraday data if you are interested. The ticker symbol is CAF (China A Shares ETF). I took a crack at the wave count for CAF myself. It is MUCHO bearish. File this one under "WTF???" Pretz, I am aware that nothing on your site is trading advice, and that the confidence you have in this count is low because you lack short term data. But, that being said, for those of us who are as dumb as the CEO of the brokerage firm in the movie Margin Call, and who thus have to be talked to in simple terms like "to a small child or a labrador retriever", the counts are bearish, are they not? Thanks. BTW, FWIW, the ECB denies the report above that it bought its own bonds. Who knows whether they are telling the truth or not. Josh from what I understand the US and Euro economies have been saddled on the back of China's economy. Thus CTP and Pretzel have looked at China's economy. If and when China's economy slows to mid single digit growth, then it is a very bearish sign. Have you looked at CAF? (Morgan Stanley China Shanghai etf) That might be a good proxy for SSEC and give you those short term moves you want. I really think the triangle works better for the LT count. For example, look at the wave you have labeled as (1) around the turn of the year... that's a pretty clear 3-wave move. It's probably a moot point anyway, because both counts are uber-bearish. Mine has a C-wave underway with a nested 1-2 series -- and yours has a C-wave underway with a bigger nested 1-2 series. But I think the triangle counts better, not that it makes a huge difference at this point. It will start to make a difference if one is trying to time the bottom, though. Regarding the ST count... that chart is pretty gappy, so hard to say fer sure. Your count looks reasonable. I would be tempted to count the whole of the most recent structure (from the 7th to present) as a leading diagonal. Tough to say, w/ all the gaps, though. Ty to all for the tip regarding CAF. I'll have a double-decaf half-caf with a twist, please. Fascinating and instructive as always, Pretz and CTP. What I take from all of this: there are more shoes left to drop. 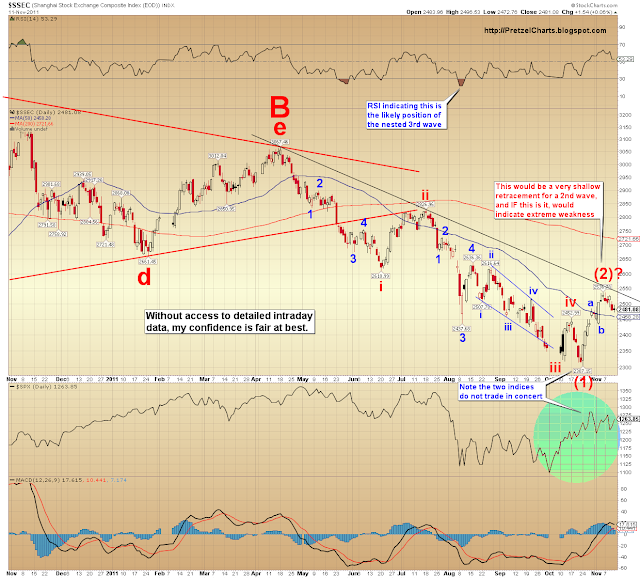 And time and major indicators are definitely on the bear case's side. These complex wave structures are still well beyond my ability to comprehend or make sense of without seeing your counts added to them, after which time what's happening and is likely to happen next becomes immensely clarified. Cogent SA Article about the structural problems of the Euro bailout plan. In a nutshell: There is no chance the scheme can possibly find enough buyers. And it was DOA from the very beginning. Shouldn't be long before everyone understands this. Apparently Europe's leadership already does. it's possible. I'm not crazy about it, because the b-wave triangle "looks" right to me... but as I said I have no intra-day data to really reconcile the count, which makes me uncomfortable -- so mine is a "best guess." that's an interesting article. I actually predicted back in '08 that the Euro would eventually cease to exist and the EU would break up. The EU is a great "fair weather" type of alliance, and it works wonderfully when the world economy is going gangbusters... but it's not the type of alliance that can handle the stress it will need to when the sh** hits the fan. Not sure if its collapse will happen as quickly as he suggests, but I think it's guaranteed to happen eventually.